There’s a deeply-held belief amongst hockey people: Hockey players are the toughest athletes in the world. Occasionally, that belief is espoused by other sports people, most notably when SportsCenter anchors refer to an athlete’s quick recovery from an injury by saying, “He’s a hockey player.” If you are or ever were part of the hockey world, however, it’s not belief so much as fact. It’s not hard to see why either. If you’ve watched hockey for a decent amount of time, you’ve noticed that it’s not uncommon to see a hockey player suffer an injury, for example a separated shoulder, and come back shortly to play in the same game in which he was injured. Often, the injury that the hockey player returns from is one that would sideline another athlete for a minimum of a few weeks. Unless the athlete in question is a baseball player. In that case, a simple sneeze might be enough to take him out. Apparently, though, fans of hockey are just as tough as those that play the game. Who knew? During Game 5 of the Chicago Blackhawks and Minnesota Wild’s first-round series, Blackhawks’ fan Donna Lebano, who was eight months pregnant, started having contractions. While most people would quickly exit the arena for the nearest hospital, Mrs. Lebano isn’t just any old person. Mrs. Lebano ignored her contractions through the remainder of the second period, the second intermission and the third period. 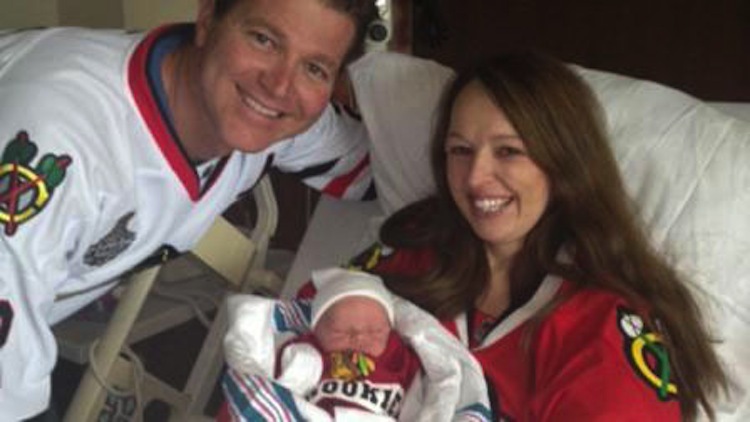 After the third period ended and the Blackhawks had cliched a 5-1 victory to wrap up the series, Mrs. Lebano rushed to the hospital where she gave birth to a son, Michael Owen, three hours later. In the comments section of articles written about Mrs. Lebano, many have accused her of being neglectful with regard to the safety of her health and her child’s well-being. For what it’s worth, a person commenting under the name “Donna Lebano” has wrote that the baby was in no danger because the contractions were only “slight” and that had they been stronger she would’ve left for a hospital. Whether or not you choose to believe that that commenter is Mrs. Lebano or not is up to you. I know neither enough about fetal care nor contractions to pass judgement on whether her actions were neglectful. Either way, you’re still probably thinking, “this is kind of insane.” And, yeah, it kind of is. But it also proves once-and-for-all that no sports fan is tougher than a hockey fan. ♦ Does Anyone Still Remember Ja Rule?